So why Ireland again? On the other hand, why not? We had enjoyed the previous two trips, and had some unfinished business with rail-related attractions in the South, so there was no reason not to like not going anywhere else. So we did. Go to Ireland, that is. And we enjoyed it, again. Truth to tell, Ireland was originally part of a larger Grand Plan, that tried to take in not only Eire but also Man. However it foundered on the practicalities of ferry timetables and opening times, and it would probably have taken too long and cost too much anyway. As it happened some of us got to the Isle of Man later in the year, courtesy of the Narrow Gauge Gathering, but that’s another story. Since the last expedition in 2009 the ferry options had shrunk alarmingly, but fortunately the Liverpool-Dublin route was still operating and still accepting residents of both North Merseyside and West Lancashire. Whether they would also take two members from the Deep South was questionable, but we decided to try smuggling them past the officials rather than go to the expense of returning their deposits. One who would undoubtably have charmed her way past any border guards, armed or not, was Hilary, but unfortunately her stamina at the time was not sufficiently robust for arduous foreign travel. We wondered whether to suggest she lent us husband John’s well-travelled credit card for the duration, but we bottled out, which was probably just as well. Next morning after a relatively smooth passage we reversed the embarkation procedure and set off through a damp and still half-asleep Dublin towards our first railway destination, via a handy McDonalds for second breakfast. The timing of our arrival meant we had an hour or three to spare, which we intended to spend down a mine. The Arigna Mining Experience, to give it its full title, was certainly that, an experience of what it was really like digging coal out of the ground in a low-budget mineral extraction facility. Labour-saving devices were few, mostly it involved lying sideways in a puddle hacking at a narrow floor-level seam, with only a candle for lighting. 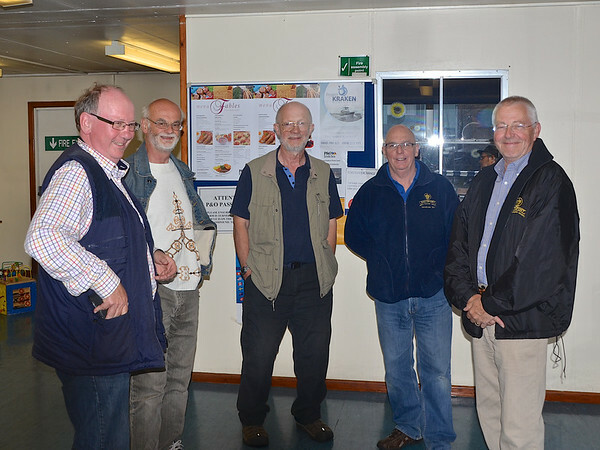 Our guide had done just that for many years, so respect was both deserved and readily given. After lunch at the adjacent pub in Dromod, we ventured into one of our key objectives, the Cavan and Leitrim Railway. A previous visit had discovered a cornucopia of transport exhibits presided over by an eccentric, enthusiastic and knowledgeable owner. We were pleased to discover all the elements were still in place, and we were not only remembered but welcomed back into a unique and fascinating multi-modal museum. 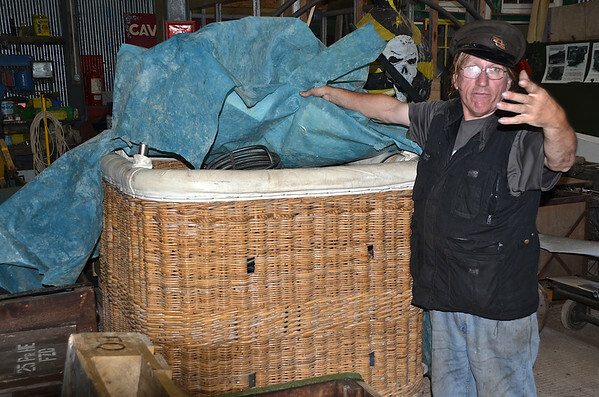 Not much seemed to have changed, some of the exhibits were a little rustier and there were one or two new items, the most unusual (but not in the least surprising, given Mad Mick’s track record) being a balloon basket. As before we experienced the multiple-headed bog-railway-diesel shunting manoeuvres, the railcar ride to the far end of the line and the proprietor’s non-stop fund of stories about his varied collection. 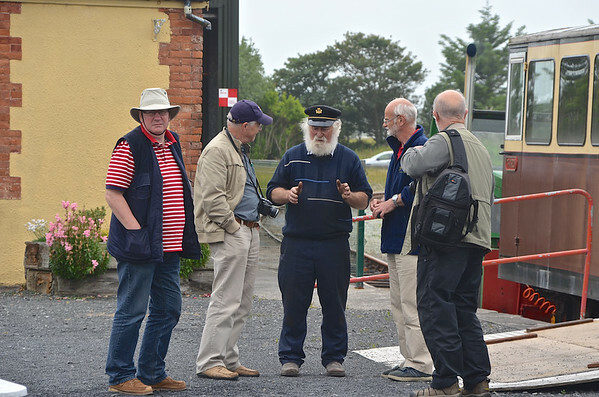 The final railway event of the day was at Lough Ree power station, also the location of a previous visit, where we called in to see journey’s end for the peat bog trains. The trucks are rotated 180 degrees to empty their loads into conveyors which deliver the peat to the furnaces. I forget the statistics of how many tonnes per day, the water content limits or how much electricity, but it was as impressive as the staff were friendly. In the UK we would probably not get past the security gate; this being Ireland we drove right in to the plant and walked on up the stairs to the control room, with no-one being in the least concerned. Overnight was at a B&B in Athlone. Next day was a Sunday, and damp as well. We drove south-west, stopping for elevenses at the small town of Gort. First attempts at obtaining a coffee, at a small McDonalds look-alike, were unsuccessful due to mechanical failure of the percolating equipment, but we were directed across the road to an altogether more comfortable, not to say artistic, establishment. 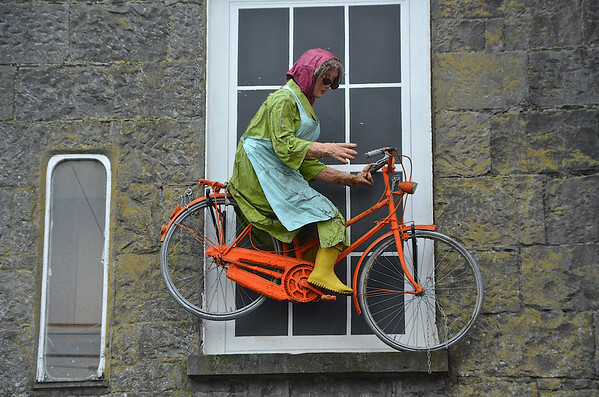 The life-size lady on a bike, bolted high up on the outside wall, was a clue to what was inside. Art prints, art books, arty wallpaper and comfy sofas, with more than adequate food, certainly an improvement even on a genuine McDonalds. 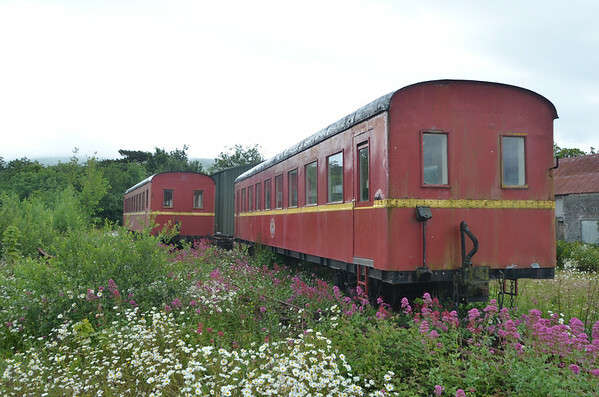 Infused with both coffee and culture we drove on to the West Clare Railway. This was a similar-sized enterprise to the Cavan and Leitrim but otherwise could hardly have been different. Notwithstanding the flashy red fire engine parked at the entrance, the railway was clearly focussed on its main objective of preserving part of what was once an extensive railway network. The resplendently-bearded owner was a local quarry operator and had clearly used his expertise, and machinery, to relay the trackbed and much else besides. The facilities included a museum, a buffet car and an 00 gauge model railway, not to mention one of the original locomotives, the 0-6-0T Slieve Callan. After a thorough exploration, including of a collection of stored carriages across the road, and a ride on the train, we departed for a B&B at Kilrush. The next railway on the list was of a most unusual type, and we got there in a less than usual manner, namely by ferry across the Shannon estuary. 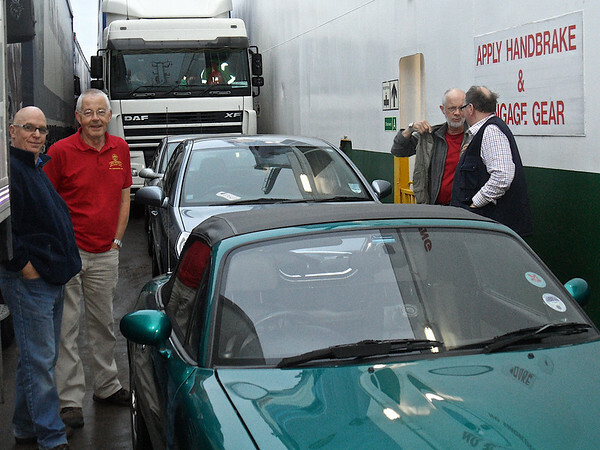 The Shannon ferry, for that was its name, runs a regular half-hourly service for both passengers and cars, reminiscent of one of Calmac’s many Scottish offerings. Fortunately on this day the weather was fairly calm, and the crossing smooth and uneventful. We had some time to spare, so we stopped off at Listowel, parking in the town square and not only partaking of the inevitable elevenses but also absorbing some more local culture in a guided tour around Listowel castle. Early afternoon saw us at the Lartigue monorail, a partial reconstruction of a rare form of transportation, the single-railed steam railway. This was built in the 1880s as a experiment, which although successful was apparently never profitable. It was certainly different, with both locomotive and carriages built as two halves and hanging off either side of a rail supported on top of an A-frame. The rebuilt demonstration line, complete with rolling stock and a complex series of points, made for a fascinating visit, notwithstanding the double-barrelled loco being diesel rather than steam. The rest of the afternoon was spent at the other end of the original line, at Ballybunion, famous for its surfing beaches, golf course and statue of Bill Clinton. We confined ourselves to admiring just the first of these, before heading off to the night’s accommodation at Tralee. 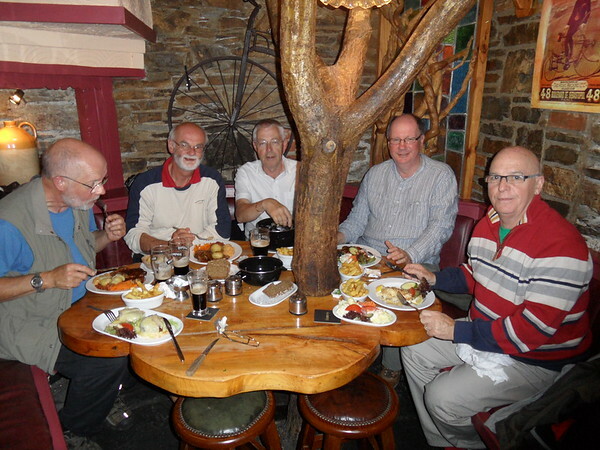 Next day we attempted to renew our acquaintance with the Tralee and Dingle railway, first visited back in 2002. 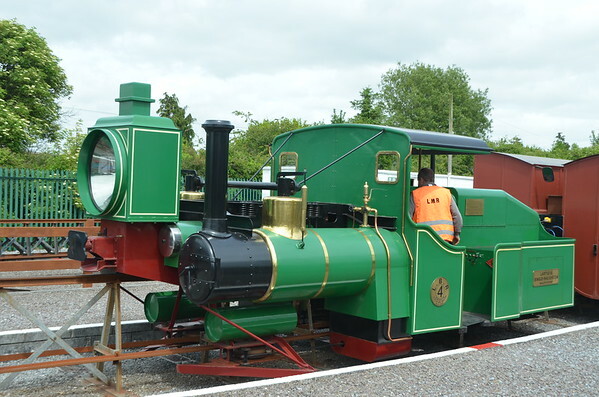 Sadly although steam trains have been running in intervening years, a combination of technical and political problems seems to have stalled any further restoration work, and the site remains closed. We consoled ourselves with taking some photos of the workshop exterior and of some rather weathered coaches, and visiting the nearby Blennerville windmill. Apart from the windmill itself, complete with working mechanism and museum, the site includes a working 00 scale model of the railway, donated by Chester Model Railway Society. As the weather turned increasingly damp we headed west to the Dingle peninsula, via a small but characterful pub, complete with a small but strangely friendly dog. We chose the pretty route via the Conor Pass, and were rewarded with magnificent views of rain-soaked cloud, through which we briefly glimpsed the falls for which the pass is famous. As we arrived in Dingle town the rain eased off and we gained some inkling as to why it was a favourite of visitors. After checking in at the smart B&B on the sea front, the town’s main street was carefully inspected, noting with approval more than one small shop that had a bar as a secondary source of income. Or primary, quite possibly. The following day was pencilled in as a part-circuit of the Ring of Kerry, anti-clockwise to avoid being stuck behind large numbers of coaches going in the traditional clockwise direction. However the cloud level was still a touch low, and large quantities of tourists were not encountered. 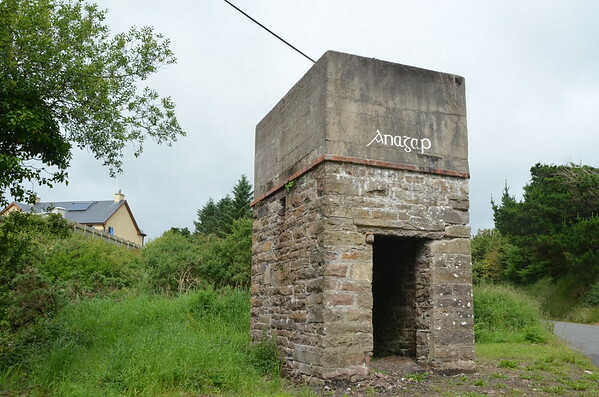 First stop was Annascaul, once a stop on the Tralee and Dingle Railway, but now with little evidence of railway works apart from a fairly well preserved water tower. Just up the road was the South Pole Inn, initially owned by the Antarctic explorer Tom Crean. He had an adventurous polar career, including as one of Scott’s support party in his ill-fated attempt to reach the South Pole, and with Shackleton on his extraordinary 1500km voyage from Elephant Island to South Georgia to seek help for his stranded crew. 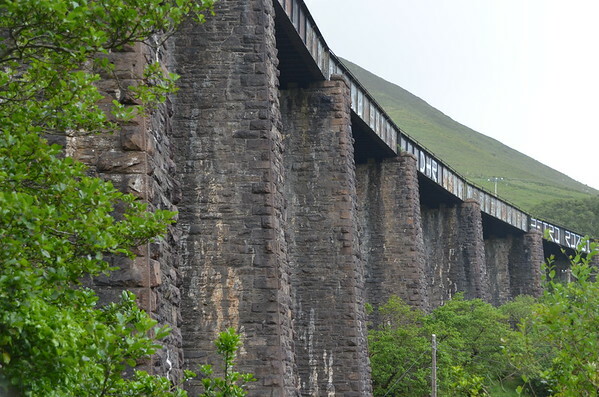 Further round the coast we stopped for some photos of a particularly scenic beach and stopped again for a particularly spectacular viaduct, part of the now-dismantled Farranfore to Valentia Harbour railway. A little further on we turned off the main road to another scenic beach, this time part of the small harbour at Kells, where we had lunch in a beachside cafe and one of us tested the health-giving effects of the waters, unfortunately only to ankle height. Mid-afternoon saw us at the village of Sneem for a comfort stop with added ice-cream, before continuing on to our overnight stop at Bantry. Dinner there in a local pub was a wooden affair, as shown in the photo. Next day was set for more railway history, in particular the Schull and Skibbereen Railway, which ran for fifteen miles between these two locations for sixty not very remunerative years. Some evidence remains, in the form of a viaduct over an inlet near Schull and a broad pathway over what was probably part of the permanent way. After careful inspection of the remains we continued to Cork, where after checking in at the B&B we split up to better explore the city. 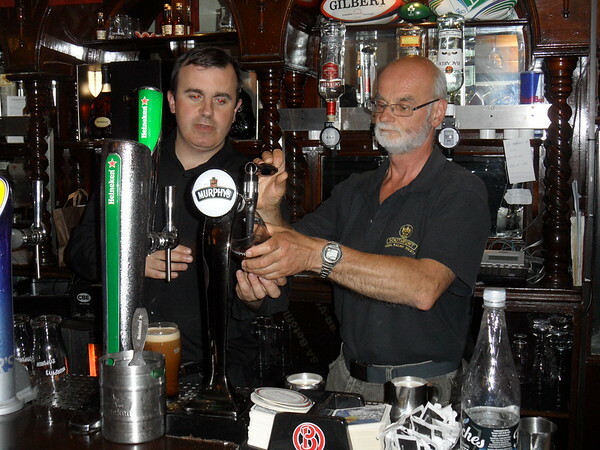 Reunited for dinner in the evening, a notable incident was Tony being brought behind the bar for some one-on-one instruction on the correct way to pour a pint of Murphy’s. He then demonstrated the correct way to drink it, holding the glass firmly in one hand and tilting it carefully towards his expectant throat, not forgetting to open his mouth at the appropriate point. After the historical interest, it was high time to get back to operating railways, albeit of the heritage variety. 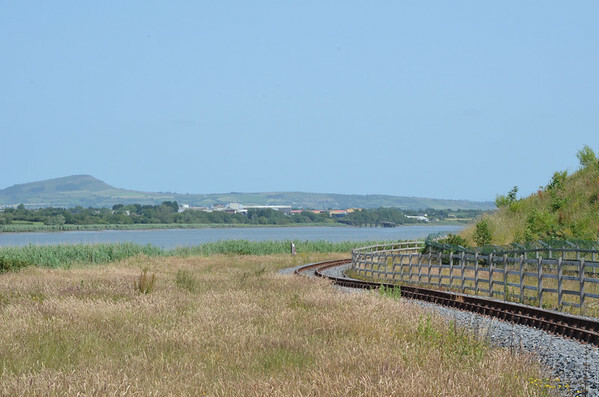 The Waterford and Suir Valley Railway is a restored section of the Waterford, Dungarvan and Lismore Railway, one of five built in the Waterford area. The current track runs for several miles along a scenic riverside route, complete with fishermen, picnickers and a cormorant perched high on the ruins of Kilmeaden castle. The motive power for the journey was a small Simplex diesel, although on walking up to the engine shed afterwards we came upon what looked like a brand new Hunslet, in a rather fearsome purple livery. A grounded Mark II coach functioned as a ticket office and shop, and refreshments were partaken of before departing. Journey’s end in Dublin beckoned, but we had one more destination to visit, without which the sense of disappointment would have been keenly felt. Avoca called us, the location of filming for Ballykissangel no less. 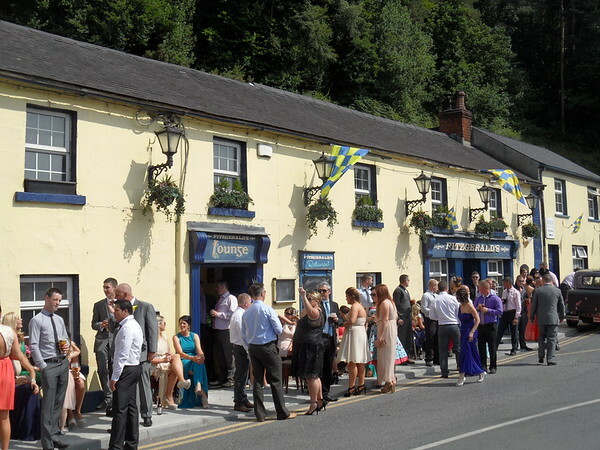 As it happened a wedding had just taken place in the village, and Fitzgerald’s was overflowing with wedding guests, unfortunately to the exclusion of other visitors come to pay homage to our heroes of the small screen. We consoled ourselves with more ice-cream, before heading off to the big city and the ferry home.